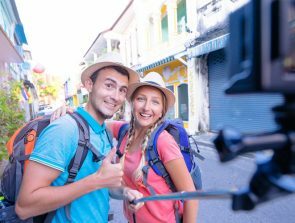 We all love to take photos and shoot video with our capable smartphone cameras. But these camera phones don’t prevent blurred images or shaky video. There is a solution by way of affordable gimbals, also known as stabilizers. This guide looks at the best smartphone gimbal choices around. Keep reading if you’re not sure what a gimbal is or why you might need one. 2-axis stabilizer and ergonomic foldable design, portable. Smooth integrated Control Panel and 2-way charging feature. Nice lightweight design and smart face tracking. You’ll know what to look for in smartphone stabilizers by the end of this short intro. Not everyone wants to be a professional photographer or videographer of course. Yet we’d all like to spend less time deleting shaky videos from our phones. That’s a frustrating and time-consuming task but it doesn’t have to be this way. 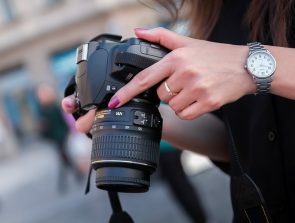 Keep reading to see how you can shoot professional looking videos. 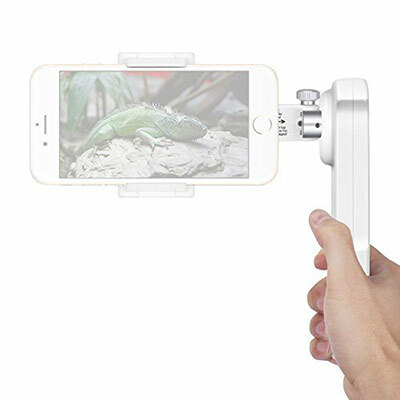 A mobile gimbal is a stabilizer for your smartphone. These clever handheld devices ‘steady’ the camera as you shoot. The outcome is a more professional cinematic video that’s sure to impress others. This is your way to get perfect results from that tiny 4k camera you carry around with you every day. Not everyone wants to be a professional videographer. But isn’t it true that we all want to produce video that’s professional? Well, now you can. Best of all is that you don’t need a high-end video camera to do it. That lightweight mobile device in the pocket is enough to make your work stand out. Camera stabilizers are nothing new. They’ve been around for high-end video equipment and DSLR cameras for eons. But gimbal stabilizers for phones and action cameras like GoPro are quite new. Handheld gimbals for smartphones are not all equal, though. Some of these products are brilliant, others good, and a few are totally useless, hence this guide. You need to think about these things so that you can make the buying decisions. Compatibility means a gimbal that works with a particular operating system or OS. Google’s Android and Apple’s iOS are the most common but they’re not the only ones. Some smartphone gimbals only work with certain phone models too, irrespective of the OS. The second compatibility issue is fit. Some gimbals won’t accommodate smartphones with screens larger than 5.5-inches. Try not to overlook the weight aspect. What seems light at first may become a heavy burden later on if you hold it for long periods. The heavier the gimbal the more you might regret it later on. Try to go for a quality product that weighs two pounds or less (32 oz.) when possible. If weight isn’t an issue then feel free to opt for a less standard heavy-duty product of your choice. Handheld smartphone gimbals come in two stabilization options, i.e. 2-axis and 3-axis. There’s no need to get too technical here but it’s important to know the differences. 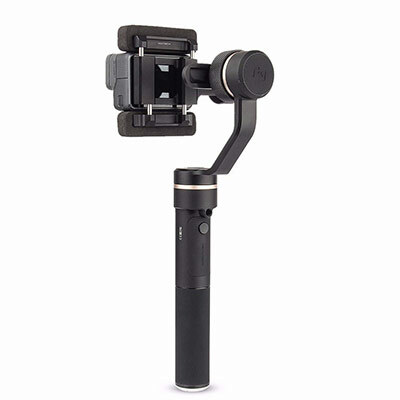 The 2-axis gimbal stabilizes the Tilt and the Roll. A 3-axis gimbal stabilizes the Pan as well as the Tilt and Roll. All it means is that a 3-axis gimbal provides better stabilization than a 2-axis option and costs more as a result. You have two choices of battery-powered gimbals. Alkaline batteries need replacing periodically but they do have the longest run times. Rechargeable lithium-ion batteries lose their charge sooner but some people find them more convenient. You can see the battery type and maximum runtimes in the specs table at the end of each mini-review. All the decent camera gimbals come with preinstalled utility software. These programs let you get the most out of the camera/gimbal relationship and can be very useful. Software programs may only work with certain operating systems so always check for compatibility. This no-nonsense guide reviews the best smartphone gimbals around right now. These seven picks are the result of personal research, the feedback of real users, and the opinions of industry experts. The table below shows the seven camera stabilizers in the same order they appear in this guide. I’ve sorted them in order of price for your convenience with the least expensive models first. My first and least expensive pick is the Neewer NW-2AG200 Smartphone gimbal. This is a capable electronic dual-axis motor gimbal that has a lot going for it despite the low cost. It’s a nice foldable design and even comes with its own carry case, thus adding to its portability. The gimbal has a nice ergonomic design and weighs less than 1/2 a pound. That makes it comfortable to hold for longer periods. Another nice touch is the Bluetooth 4.0 remote control. Being compatible with both Android and Apple systems is another welcome feature that not all handheld gimbals provide. There are a few complaints that it’s fiddly to set up. Most of these are probably from first-time users, impatient to get started. It’s not difficult as long as you take your time and read the instructions. You only get a 2-axis gimbal but it does a great job of adjusting tilt and roll. The 1000 mAh lithium-ion battery gives between 2-5 hours run time depending on the phone. At less than 50 bucks, there’s not much to fault, not at this price. One of my gripes concerns the long battery charging time. It can take anywhere between 2-3 hours depending on the power source. 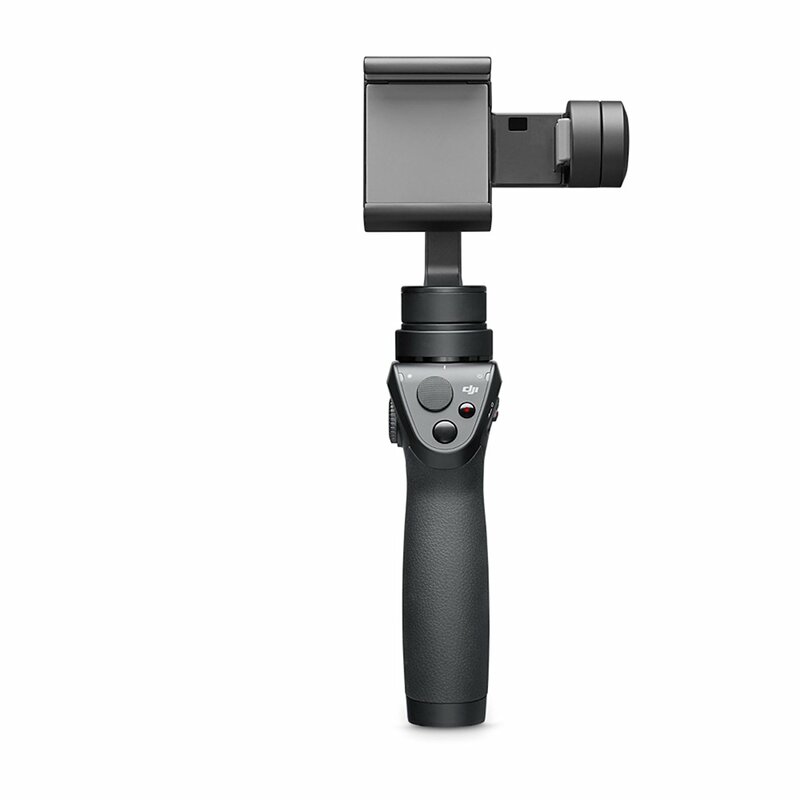 The other con is that you can only use this gimbal with your camera in landscape (horizontal) mode. Smartphone gimbals are amazing tools but it does mean one extra thing to carry. The Mechanical folding design of the Hohem makes it more portable and is one of its many great features. 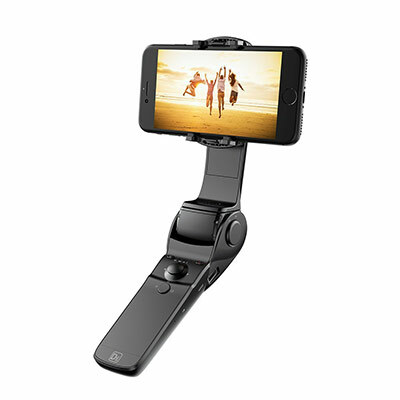 This 3-axis gimbal stabilizer accommodates smartphones with screens up to 6-inches in size. It has many bells and whistles and offers a lot for the money. The visual auto-tracking shooting is a smart feature. What this does is automatically track and adjusts the camera’s angle to follow the subject. Most battery-operated smartphone gimbals have app control but not all apps are equal. The downloadable app for the Hohem Handheld Gimbal won’t let you down. It’s easy to use and provides a plethora of practical interactions via the built-in Bluetooth. Another welcome feature is the click 180/360 panoramic views. Also worth a mention is the 6-inch maximum screen size that accommodates a wider range of iOS and Android smartphones. And the built-in power bank keeps everything charged up as you film. It’s not difficult to work out how to use this smartphone gimbal. Reading instructions is usually quicker than trying to figure things out alone though. The problem with this model is that the translation from Chinese to English is not good. There are sections that may leave you more confused than before you read them. My advice for anyone who’s stuck is to search for YouTube video guidance. The only other gripe is that Bluetooth connectivity can be spotty on occasions. There are many great features with the Snoppa M1 smartphone gimbal. Now add to this its compatibility with just about any smartphone and you have a very versatile tool. This handheld gimbal looks smart and functions well. It’s not without a couple of faults and I’ll get to those shortly. The advanced 3-axis stabilizing algorithm makes using this tool a cinch. All you do is point in the direction you want to video and the camera smoothly follows. It really is that simple. Most smartphones gimbals have a set size of 5″, 5.5″, and 6-inches. This one doesn’t have any such model or size restrictions and that makes it unique in my book. Many great features help make the M1 easy to use. It’s quick and easy to set up out of the box, portable, and built from durable plastics. There are also multi-mode functions to choose from and intuitive controls. Snoppa goes into a lot of detail about their product so check their page if you want to know more. The reason the Snoppa M1 smartphone gimbal doesn’t get five stars is that it has a few faults. Yes, it accommodates just about all smartphones and that’s a huge plus. But it loses points because it won’t hold smartphones with their protective covers on. You might just get away with a gel-style phone case but it won’t grip anything thicker. It’s not a major issue but it’s an inconvenience nonetheless. The other disappointment is with the M1 app. The app has everything you need in theory. In practice, though, it can prove difficult to use even connecting it to the gimbal. As for the phone’s camera, well, it may be simpler to use the native phone app to control it. The good thing about apps is that companies can improve and update their software so this criticism could be short-lived. Technologically advanced 3-axis stabilizing algorithm. 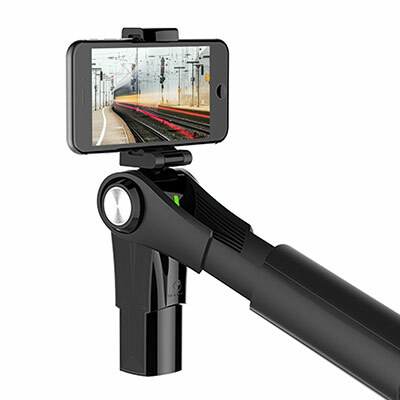 The Zhiyun Smooth 4 transforms regular smartphones into professional filmmaking tools. It sounds like an exaggeration but the ability of this gimbal makes a huge difference to video quality. This attractive well-made handheld gimbal even comes with its own mini-tripod. The fingertip controls and ergonomic design add further to its appeal. Switching between the gimbal modes is a breeze. This is thanks to the smart integrated Control Panel and a trigger button on the back. Another cool feature of the Smooth 4 is its two-way charging feature. You can easily recharge the stabilizer with a portable power source. And to charge an attached smartphone you simply connect it to the stabilizer’s USB port. More good news is that the gimbal’s runtime is an impressive 12 hours. Object tracking is another feature that takes the stress out of filming. The Focus Pull & Zoom is an ingenious focus puller (hand-wheel) that helps capture high-precision focus changes. The gimbal’s advanced shooting features include slow motion, time-lapse, moving time-lapse, motion lapse, hyper-lapse, and a few others. And the ultra-smooth functioning hotkeys do away with touchscreen control. There will never be a perfect handheld smartphone camera gimbal but the Smooth 4 by Zhiyun comes close. I only came across one major fault but it’s a biggie. The gimbal doesn’t seem to like Android-operated smartphones. The app for Android seems buggy with some models even with the correct version. Not everyone has problems but there are enough complaints to know it is an issue. Hopefully, the company has listened and resolved—or is working to resolve—their Android app. Reports of buggy or dysfunctional Android app. The EVO SHIFT is another reputable 3-axis handheld gimbal. This device is for Android and iPhone smartphones. That includes plus sizes as well as regular models. No one ever complains that a gimbal is too easy to use—no one. Most people find the EVO SHIFT simple to set up and get working right out of the box. Not only is it smartphone compatible but you can mount GoPro action cameras too. That makes it especially flexible for folks who need the extra versatility. There’s a built-in charging port too, which is always welcome with battery gimbals. The built-in ¼-20 threaded mount is another of those small but welcome extras. For example, there may be times when a situation requires a tripod or monopod and you have that option. Other smart features include object tracking, auto panoramas, LIVE Video capability, and unlimited 360° pan. It won’t surprise you to learn that the app is not up to par if you’ve read the other reviews. A few of these companies don’t seem to be able to get consistent app functionality for some reason. The EVO app reliability can vary from iOS and Android devices and even different phone models. The gimbal will still function without the app so it’s more of an annoyance than a major setback. 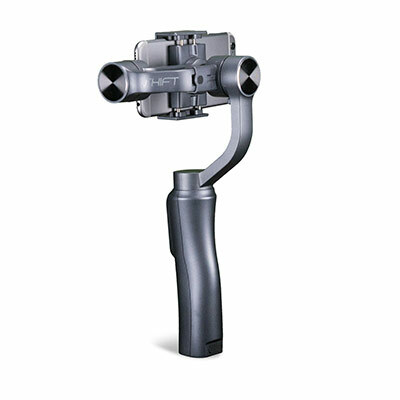 The penultimate pick is the FeiyuSPG (upgraded version) 3-axis handheld gimbal. It’s a splash-proof design—a feature that’s sure to appeal to outdoor types. The FeiyuSPG is comfortable to hold and easy to use like all the gimbal picks on this page. The 12.5-ounce solid aluminum alloy body makes it easy to hold for long periods. Its unibody motor arm design helps to accommodate major smartphones and some action cameras. 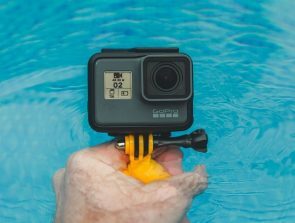 These include the popular GoPro range and other brands of similar dimensions. Some of the standout features include smart face tracking and portrait mode. The face tracking follows the target face and guides the gimbals’ 3-axis movements to steady the footage. And the portrait mode is not something all gimbals offer. The vertical format and adjustable panning angle make it ideal for live streaming. It’s perfect for social media networks like Facebook. The FeiyuTechSPG gimbal instructions are okay until you have an issue. There doesn’t seem to be a proper troubleshooting section. This wouldn’t usually be a concern. The problem here is that it’s an upgraded model. 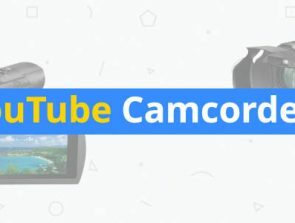 That means it doesn’t have online user support like older or better-known gimbals. Compatible smartphones: iPhones, Samsung’s and others of similar size. 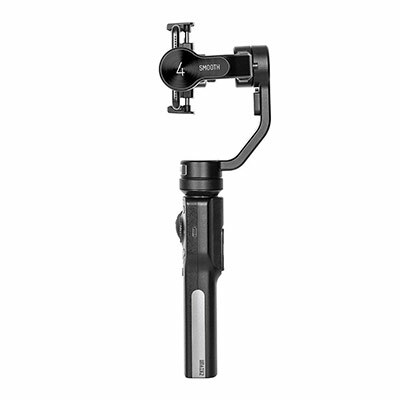 The final pick of handheld smartphone gimbals is the DJI Osmo Mobile 2. It’s super-easy to use, lightweight, has great battery life and comes with a range of intelligent functions. This is DJI’s next generation of handheld gimbal stabilizer. It’s also better and cheaper than its predecessor was. The modified design has a more compact folding mechanism that makes it extra portable. Not only does the Osmo Mobile 2 look the part but it feels great too. And you won’t have to panic about losing power mid-shoot with its 15-hour battery life. The brushless motors are robust, reliable, and long lasting thus adding to the gimbal’s stability. The reliable ActiveTrack feature gets much praise from reviewers. It does a great job of following any subject you select and will stay with it for as long as you need it to. The built-in zoom slider is another useful feature for creative filmmakers. The convenience of operating a smartphone camera from the gimbal’s handle is no gimmick. The cinematic zoom feature results in footage that’s fluid and more professional looking. Keeping with the “professional” theme, you can even produce the bizarre cinematic dolly zoom effects with this gimbal. Time-lapse recording is another special effect that smartphone videographers are starting to appreciate. Think blooming flowers or rolling clouds over a static landscape as a couple of examples. Anyone with a modern smartphone can enjoy the Osmo Mobile 2 thanks to its spring-loaded clamp. Despite its good looks, ergonomic design, and nice feel, there are still complaints about the materials. There are no reports of the gimbal being fragile or breaking. Despite this, some users still comment on the cheap plastics used in the build. There are a couple of less critical gripes too. One is that a USB-C port would have been preferable to the Micro-USB port. The other is that it’s awkward to swap between landscape and portrait orientation. MOZA Mini-MI smartphone gimbal could make for an excellent addition to this list, and is suerly superior to some of them in the list with the price tag of $99 and 300g max payload.